Let’s start with the, “Why do you care?” question. Short answer: You don’t! You’re a business owner or manager, not a computer tech/system engineer. But… you might care, if you knew a little bit about it. And by that I mean, knowing what it is and more importantly, how it benefits the business using it. For this blog, virtualization is the ability to run a server one or more operating systems, such as Windows Server or Linux, on a single physical server (hardware). This is the “traditional” or more common way businesses have run server software for years. To help with the above definition and understanding, let’s talk about a traditional setup. This is where you purchase a physical server and install an operating system (Windows Server/Linux) on the server. This is the physical hardware. The CPU (processor), the harddrives (space), the memory (RAM), the I/O (network card, keyboard inputs, USB ports, etc.). It is the machine as it sits in your computer room or in a network rack. The server operating system interacts with the hardware on the physical machine directly (through drivers). One physical machine has a single operating system and whatever servers/services you install on it. In a virtual environment, you start with the same physical machine. It still has CPU, harddrives, memory, and I/O. Rather than install your server operating system directly on the server, you install a piece of software called a Hypervisor. 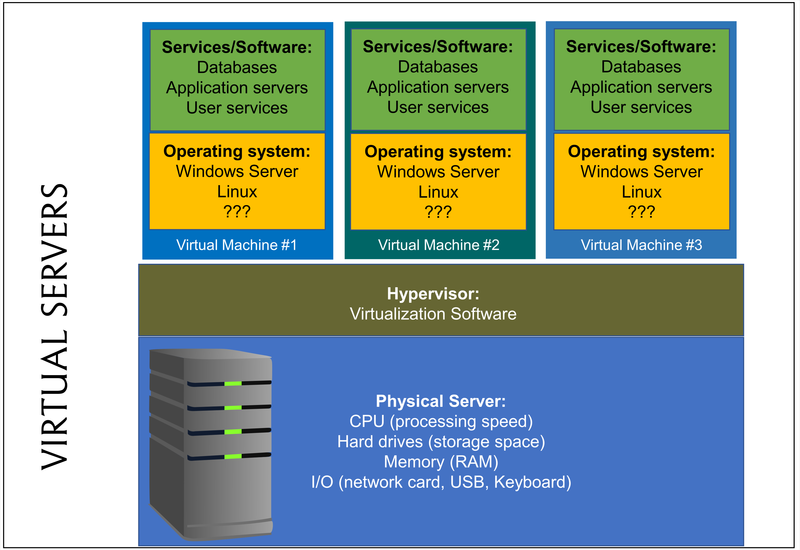 The Hypervisor is software that interacts with/recognizes the hardware and then allows you to host virtual machines. You can allocate how much memory and diskspace the virtual machine will use. You can, in some cases, even allocate how much processing power the virtual machine can use. The hypervisor will let you build/configure more than one virtual machine. Therefore, on a single physical server you can install multiple servers. The servers share the hardware/resources of the physical machine. Most servers are not taxes or highly utilized, so virtualization lets you better utilize the hardware you purchase. 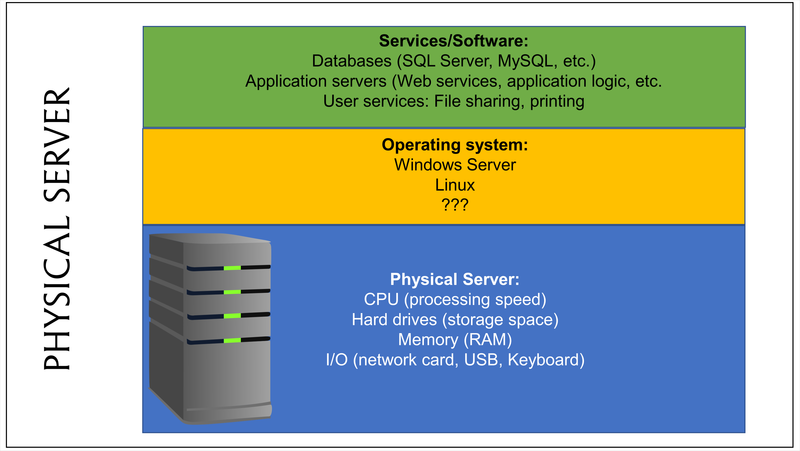 The image below displays the relationship of server operating systems to the hypervisor and the physical server. Virtualization has the following benefits. Better hardware utilization. 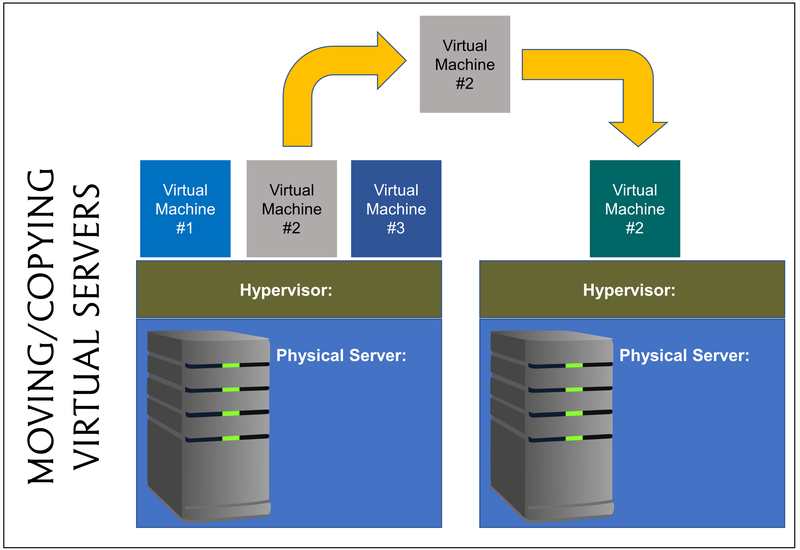 One physical server can run several virtual machines – depending upon CPU and memory used. You can separate functional services, allowing you to configure and restart services without restarting your entire server environment. You can backup virtual machines in their entirety. This means you can restore those virtual machines offsite if needed in case of a disaster. You can move a virtual machine to a new physical server if the resources are needed. This is far superior to having to do a complete reinstall of a new server. The virtual machine will get the benefits of the new hardware immediately upon moving it. You can setup live replication of virtual machines to a backup physical server or to the cloud. In this way, if your physical server fails, you can immediately start the virtual machine(s) in a new location. The image below demonstrates copying/moving a virtual machine from one physical machine to another. This is FAR more efficient than having to do a new operating install and then migrate/move services to the new machine. The virtual machine, along with it’s name, IP address, databases, services, moves seamlessly to the new hardware. I’ve only touched on the actual details of virtualization and I’ve tried, where possible, to avoid technical details except as a way to clarify terms. Virtualization is an effective way to maximize hardware and provide much better backup and disaster recovery options. You can even run a hypervisors (virtual machine hosts) on your desktop/laptop. This is great for developers who may want a test environment for running their applications without installing all the software directly on their computer desktop. If this confused you or left you with questions, just ask. I’ll do my best to provide some clarity. Posted in Consulting, Tips and Tools and tagged hyper-v, Network Optimization, networking, virtualization, vmware.